I started playing Fortnite when there was only the game mode "Save the World" after a Reddit guy sent me an early access code. Before that, I was playing PUBG and H1Z1. When Epic Games released a Battle Royale mode I was so excited. I always imagine how a battle royale game would be with those innovative building mechanics. In this page I share my review of Fortnite Battle Royale. I played the game on my PS4. Fortnite Battle Royale is a game like no other. There are a few things that lead this game to be not just my favorite battle royale game, but the most entertaining game I've played in years. The first thing is the building mechanic, which allows you to move up vertically in an instant, protect yourself from aggressive players, save teammates from getting shot, get into intensive build battles, reposition for a better field of view or a sniper shot. 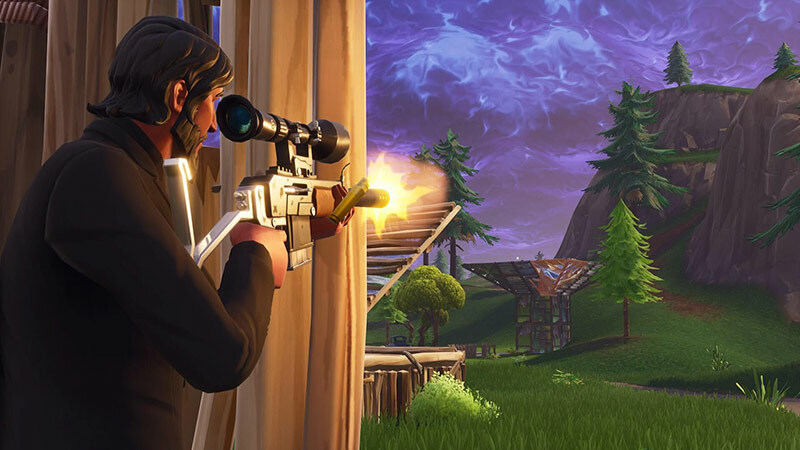 In Fortnite, it's not the person who had the best weapon or aim that is likely to win, but that player who has the better build skills. This player is likely to survive longer and win the match than one that just thinks he brings his CS:GO or COD aiming skills and wins every single time. It doesn't work like that in Fortnite, and some great COD and CS:GO players have problems winning matches when they come to Fortnite Same goes for players that come from other battle royale games like PUBG. This is a different game that requires a different set of skills, not just great fast weapon reaction time, and accurate target acquisition. The second thing is the design of the game. Some might not like cartoony visuals, but I personally do. In fact, there were many of my friends who complained about that, but now most of them play the game, so it's not that after all. The game has a colorful and inviting presentation, which makes the game more joyful to watch and a great victual place to be in when playing for a long period of time. I remember Blizzard talking about this subject, seeing that players prefer being in a bright and colorful area in World of Warcraft than in dark and depressing areas. The third thing that I like about Fortnite Battle Royale is the arcade-style game. Fortnite BR doesn't go with the realistic gameplay approach like PUBG or H1Z1, instead, it's kind of a fantasy game in a sense. This means that Epic Games can introduce some really cool items and features that you probably wouldn't find in a realistic Arma-style shooter. For example, you have jump pads that throw you up high, cool jetpacks, cool looking pickaxes, amazing looking avatar skins, rift portals (like wormholes) that let you spawn and fall down from a crack in the sky, stink bombs, grenades that spawn a huge metal structure on impact, etc. All those cool features are available because Epic Games created a game with unrealistic features. Those cool features appeal to a wide audience, including those who come from Minecraft or similar games and love the building mechanics (and it's a huge audience that follows a large previous trend), those who love cartoon-style or sci-fi games and prefer games with more creative gameplay features. Furthremore, by going this route, Epic Games has more creative freedom. They can create cool ideas which other, more realistic games, just couldn't add to the game, as it would shatter the realistic experience. This is a huge thing and it creates a tremendous anticipation because you never know what's coming out next and Epic Games always surprises with some new amazing features that no one expected. Every season brings new cool gameplay features that are fun and entertaining. Another thing that I like about Fortnite is that it's a "kid's friendly" shooter. Well, let's put it this way. Fortnite is rated 13+ on common sense media and PEGI 12+. So it's not actually for kids, but it's definitely tailored also for the younger audience, it's not PEGI 18+ like Call of Duty WWII. You won't see any gore, blood or intensive violence. This means that even for adults, the game creates an atmosphere that is more about having fun rather than an atmosphere of war and violence. It's also, therefore, more proper for streaming if you want to appeal to a wide audience, which includes kids and teens as well. One of the best things about Fortnite Battle Royale is frequent updates. Now, I was playing Paragon, a project that was later closed as devs moved from that game to push Fortnite forward. This was another game made by Epic Games. Although the game was eventually closed, Epic Games was releasing frequent updates and you always felt that there is something new coming almost every week. Now just imagine that this was a game with not such a big success. With Fortnite, you see updates every single week. Epic Games continues adding new weapons, items, skins, and cool new features into the game. This has many advantages. First of all, high expectation for new content almost every week. Second, it's great for streamers because they always have new fresh content to share with their viewers. Third, it lessens fatigue, so the moment you start getting a little bored, something new comes in an reignites that excitement. Fortnite was designed not just to be fun to play, but also to be a game that is fun to watch. This is a very important thing that helps further promote the game. It's like free advertising. When people enjoy seeing Fortnite BR streams, streamers will continue playing it and more people will know about Fortnite and will play the game. It's like creating a great TV show that gets new chapters to watch every week. Fortnite Battle Royale is a game that can help players deliver great moments, including amazing plays, epic fails, cool trick shots, amazing build battles, etc. These are stories that entertain viewers and makes them want to clip those play and share them with others. Battlefield (from EA) is one of those games that you enjoy watching because it does exactly that, create cinematic gameplay shots that are immensely entertaining. Fortnite is similar to Battlefield in that sense because it has a platform that allows players to have fun and create plays that transfer well on screen. It's like directing your own movie or being an actor in a great epic battle scene. This is yet another viral way to help the game reach a large audience and become an entertainment medium even for those who don't play the game and just enjoy watching great entertaining moments in video games. Fortnite Battle Royale is a free-to-play game on any platform it is released, which includes PC (Microsoft Windows), Xbox One, Nintendo Switch, PS4, iOS, and Android. This helps the game reach a very large audience. This has many advantages, including the fact that there is always someone you can play with (instant matchmaking), you feel part of a great large community, it's profitable for streamers and content creators, and you probably have a friend that plays the game so you can play together. For me, being able to play with my friends is the most important thing in multiplayer games. When a game is free, I know that at least my friends will give this game a try, but if it was a paid game, some of them might won't join in. This also helps the developer, because it increases retention. Fortnite is available on Android and iOS. This means that you can continue playing the game when you are on the go, so you are not just restricted to playing it in your home. It's also available for the Nintendo Switch, which is a portable console. It's great knowing that you can play your favorite game when going on a vacation, at your friend's house, or even on the bus on your way to school. Fortnite is a game that is very fun to watch. It is different than many other eSport games because it requires lots of players playing against each other at the same time in the same match. In some ways, it's kind of a bummer playing a game in a tournament where you are out if you die. The only thing left to do is just watch your teammate play until the end of the game. This can also make players less "warm" and ready for the next match compared to players who play longer during the previous match. That being said, the game transfers well into eSport because it's fun to watch and it attracts many viewers. I still think that this format is hard to produce and maybe in the future, we'll get to see smaller maps with fewer players, so it will be easier to create custom competition events. With 100 fighting the same match, the chance of winning is quite slim. It's not fun losing, but what drives me forward is the great feeling of being able to get to be first among 100 to win the game. I don't get to achieve that every single time of course, but when I do, I feel very satisfying and proud of that achievement. Even if you don't win, you can still progress in the game and finish quests to unlock new cool items. Fortnite Battle Royale is a fantastic multiplayer and among the best Battle Royale games out there on any platform. It's a game like no other, one that requires skill and adapting to a new type of gameplay mechanics. The game takes place in a beautiful vibrant world, a place that you just want to stay in and never leave. Frequent updates keep the game fresh and anticipation high. There are microtransactions, but these are only for cosmetic items an the most expensive one is $10. As a player, you feel that you get a lot in return. The game plays great on all platforms and it one of those game that you just can't stop playing or watching. If you haven't played it yet, there is no reason not to give it a chance, it's free after all. In Battle Royale Plays you can find lots of amazing Fortnite Battle Royale plays. So head on to our Fortnite BR section and check out those amazing plays yourself, have fun!